The crane was built in 1931 by Craven Brothers for the LMS Railway. It was for many years part of the breakdown train at Willesden MPD, and was one of the cranes used to clear the wreckage following the tragic rail disaster at Harrow and Wealdstone in 1952. It ended its railway operational life at Allerton, from where it was purchased by the Bahamas Locomotive Society in December 1981. The crane’s boiler underwent its periodic overhaul during 2013 to ensure the crane’s operational viability. 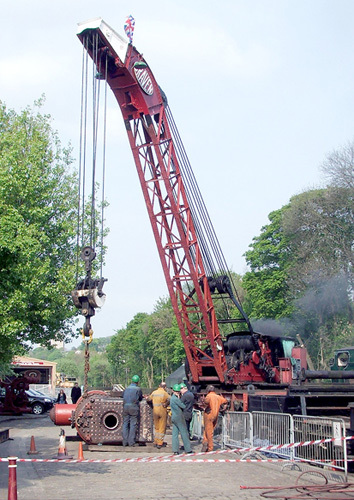 The picture above shows the crane in action during 2011 at Ingrow, turning the boiler of LNWR Coal Tank 1054.